Patience paid off for this photographer's perfectly polished abode. “It was the quintessential ‘move to San Francisco and find yourself’ story,” says Amy Harrity of swapping life in Kentucky for the West Coast. The full time photographer has spent the better part of the past 12 years mastering the ins and outs of the Bay Area. Now a seasoned San Franciscan, Harrity, along with her husband, has only recently begun to see the city through a new lens: That of first-time homeowners. “It’s not something we were that prepared for, but it was kind of a once in a lifetime experience,” shares Harrity. Situated on the quiet island of Alameda, the couple’s house (built in 1912) is as quirky and charming as the neighborhood itself. The pair’s transition from longtime renters to homeowners was anything but expected. Prior to acquiring the duplex they now call home, Harrity and her husband had been renting the upstairs unit for three years. It was only when the couple learned that their landlord was entertaining the idea of selling that they jumped at the opportunity to buy. “The place needed work, but I think that’s why selling to us was so attractive. We had been living in this place and were familiar with all its quirks. We had an understanding of what we needed to do to get it to a place we wanted,” explains the photographer. After making their move downstairs (the couple currently manages tenants in the upstairs unit where they used to live) Harrity and her husband set out to make the necessary upgrades they had long dreamt of making as renters—updates like repairing the pillars on the second floor balcony that were slowly deteriorating and installing new flooring. “You’re not going to see a lot of cosmetic difference. Because the home is so old, making cosmetic changes is a little more difficult because we’re bound to a historical home,” says Harrity. The most notable difference came in the form of a freshly painted exterior. “It had been 20-plus years since the house had been painted—there was a lot of water in the walls. That was great because it was a cosmetic change and a necessity,” she explains. Inside, Harrity was determined to maximize the downstairs unit’s minimal access to natural light. Whitewashing the entire space (with the exception of an accent wall in Benjamin Moore’s “Odessa Pink”, Harrity stuck to “Swiss Coffee”) was just one part of her home-owning cleanse. With this newfound care for clutter came an appreciation for never settling on style. Taking the time to collect pieces that mattered, Harrity wanted to create an aesthetic that felt balanced and warm—not store-bought. “I definitely don’t want everything to look too West Elm or too California,” she says. Vintage pieces with sculptural appeal and warm wood tones are just two standout elements that have come to define her space. 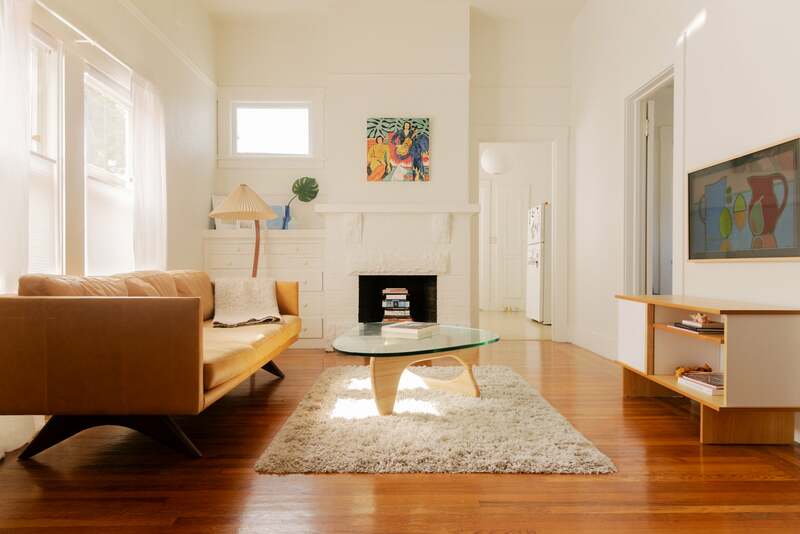 Accompanying a Herman Miller look-alike coffee table, Harrity’s favorite living room find has to be the curvy floor lamp in the corner—a sought-after vintage piece that took her on an all-consuming hunt. While their former rental is officially starting to come together as a well-loved home, Harrity has big plans for the upcoming year. Converting the two-car garage into a functioning in-law suite and replacing the concrete patch by the front door with a lush garden are two of the projects the duo hopes to conquer in 2019. But top of her wishlist? Get the fireplace up and going, stat: “I’m hoping for a Christmas-y fireplace,” she says.